Skype Video Calls on Android Phones | Tablets | Free Pc to Phone Calls, Free Voip Calls to India International ! With smartphones getting popular, use of internet on mobile is becoming quite common. It is not just limited to traditional phone calling (using telecom service), but people now use this for video calling as well. One of the most popular voip app (voice/video) for smartphones is Skype. It has a large number of customers and the number is growing everyday. Today we will be looking at the Skype application (which allows video calls) on Android Mobiles. 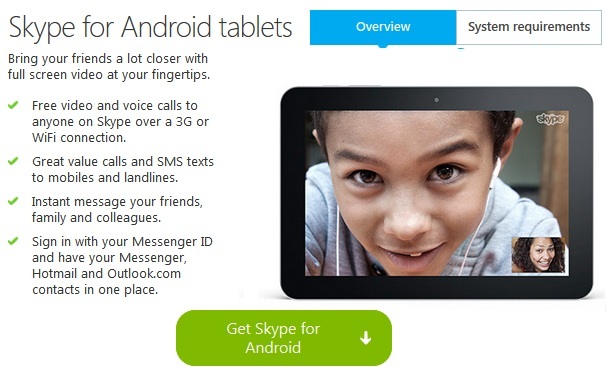 Skype App for Android Mobiles is available for free download in the Android Market (Google Play). Please note that there are a few things which needs to be considered before you jump to android market to download this app. - If you're using Android 2.2 (Froyo) or greater on a device not listed in the section below, you should still be able to enable video calling in Skype settings. Quality of calls may not be good for certain phones or with low speed internet. - On Android 2.2 (Froyo), only the back camera will work. This is because only devices running Android OS 2.3 or higher allow apps to access the front facing camera. - If the setting to enable video calling is not available in the Skype Settings on your device that means video calling is not yet supported on your phone. Basically, video calling is supported on mobiles with front facing camera (froyo phones). If you are not having a smartphone with front facing camera then I would suggest you to try Tango Video Calls on your smartphone or may be you can try ooVoo as well. The good thing about Skype application is that the voice calls and video calls to your Skype friends are free. You can also call your buddies on other devices (other mobiles/landlines) at cheap international rates. You can opt for various Skype Cheap Calling plans to get cheap international rates.